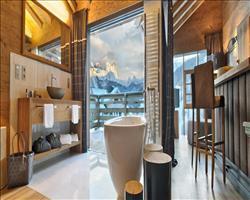 The ultimate guide to San Cassiano ski holidays. For such a tiddly, traditional village, San Cassiano has a tremendous amount of luxury: dine in 2 and 3 Michelin starred restaurants, sleep in 4 and 5 star hotels and when you’re not roaming the dizzyingly pretty pistes of the Dolomites, spend time in rooftop pools and spas. With the craggy peaks of La Varella, Conturines and Lagazuoi overhead, this is a dreamy Dolomite village of Tyrolean timber buildings and an 18th century church. A cocktail of Italian, Austrian and Ladin cultures come together here in South Tyrol – earning the resort its three names of San Cassiano (to the Italians), St. Kassian (for German-speakers) and San Ciascian (in the Ladin mother tongue). For such a tiddly settlement (just a field for farming livestock about a century ago), San Cas has a lot to its name(s): serious luxury can be found in the form of posh hotels and Michelin-star dining, and this with the discreet nature of the locals makes the place a favourite of the ridiculously famous who want to ski free from crowds and paparazzi. The location bursts with history, from its role as the last Austrian bastion before the front line in WW1, to the 40,000-year-old remans of the Ursus ladinicus bear found in a nearby cave. There’s also the matter of the staggeringly vast, beautiful ski area on its doorstep – the Dolomiti Superski, where UNESCO listed limestone peaks guard a dozen ski areas, with 1200km of slopes in all gradients imaginable. Hotelier Engelbert Pizzini built San Cassiano’s first ski lift in 1957 and the rest is history… The local ski area’s the amazing Alta Badia, which you can easily reach from the village’s cable car. Most visitors fly into Bolzano or Innsbruck airport, which are 2-2.5 hours away from the resort by car. If travelling by rail, the nearest station is Brunico (37km / 50 mins drive away) while Bressanone and Bolzano are also within easy reach (65km / under 2 hours). 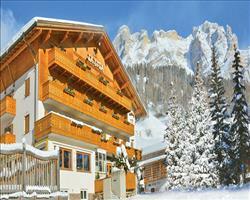 The Piz Sorega cable car whisks you up into the Alta Badia area which totals 130km of slopes. If that’s not enough to fill your boots with, there’s a whopping 1200km to explore when you look at the whole Dolomiti Superski. Alta Badia’s one of our favourite ski areas for beginners – abundant with wide, confidence-boosting blue runs and scenery that’ll have you hooked on skiing in no time. The Scuola Sci San Cassiano teach up at Piz Sorega, and once you’re confident stopping and turning on the practice run (#30 on the piste map), zig-zagging tree lined blue 11 back to the village is a breeze. Other options back to base are blue #9A-9 from Pralongia – a cruisey descent with incredible views of the peaks – and red #12 from Sorega which you can really tear down. #23 down to Bamby is a very wide, scenic red that leads over in the direction of neighbour La Villa. Intermediate skiers can’t miss out on the Sella Ronda circuit, which links Alta Badia with Val Gardena, Arabba and Val di Fassa and has some stunning stopping points along the way. Also, the legendary Hidden Valley run on the Lagazuoi mountain is too close to miss out on – with horses at the bottom to pull you along the flats to the ski lift. For experts, the black run from Piz La Ila down into La Villa is the famously difficult Gran Rita piste, which with a gradient of up to 53% is part of the World Cup circuit. Freestylers are in luck, with Alta Badia’s snowpark easily reachable from Piz Sorega. It has a gentle beginner’s area with flax butter boxes, 4m kickers and a banked turn, all kinds of medium obstacles and a 13m kicker, 8m rail and 10m corner jump for experts. If you prefer skinny skis, the Armentarola cross country centre has 25km of trails. After drinks on the terrace of the Las Vegas Lodge, fabulous food and wine make up San Cassiano’s après ski scene. By hook or by crook, a table at St Hubertus in the Rosa Alpina Hotel is a must for any serious foodie – holder of THREE Michelin stars, chef Norbert uses Alpine flavours and unique techniques to create food worth travelling hundreds of miles to try. Also well worth experiencing is La Siriola, which has two Michelin stars for its characterful cuisine created by Chef Matteo Metullio. For a lively buzz and hearty portions, the Wine Bar & Grill (also in the Rosa Alpina) is worth a visit. And for pizzas, try L’Tiac or sweet treats, Café Ploner. Later-on, the thirties themed Hugs’ disco bar is your spot for cocktails and dancing. Snow fun comes in all forms over here, one favourite being the Foram Toboggan run - over 7 kilometres of snowy fun taking you down to San Cassiano. Snowshoe hikes are another popular activity. The Museum Ladin Ursus Ladinicus in village centre tells of the area’s history and traditions, with its main focus being the discovery of the 90,000-year-old Conturines cave with its remains of ancient mountain bears. When is the best time to ski San Cassiano? The climate and technology here result in excellent artificial snow cover – 4700 cannons cover a mammoth 1100km of the Dolomiti Superski – which sees the Alta Badia runs skiable even when the rest of the alps are struggling. This makes San Cassiano a good choice of ski resort if you’re travelling early in the ski season and want to bolster your chances of good ski days. For natural snow cover, January and February usually see the best conditions. Alta Badia’s cruisey, confidence boosting ski area is terrific for families, whether you’re on your first ski trip ever or a clan of long-time snow lovers. Lessons with the Scuola Sci San Cassiano are far cheaper than you find in France, with private tuition in San Cassiano often costing less than group lessons would in the big French resorts. There are some gorgeous routes for intermediates and above to ski together, like the Sella Ronda circuit and the Lagazuoi or ‘Hidden Valley’ run with its charming horse drawn ski lift at Armentarola. Skis aside, the 3.5km toboggan run from Piz Sorega (where the nursery slopes are) back to the village is great fun. When it comes to indoor activities, one of our favourites is the climbing wall in Hotel Störes and most of the 4 and 5 star hotels have swimming pools and wellness facilities. Come here over the Christmas school holidays and the atmosphere’s infectiously festive with market stalls and age-old traditions. The slopes tend to be quiet over the half term holiday, with Italian schools not having a break in February. And though this isn’t the highest ski area in the world, an Easter holiday of morning skiing and quality time together in the afternoon sunshine can be brilliant. Roam the snowy Dolomites by day and settle down in charming San Cas by night – this resort is marvellous for group holidays. Groups of foodies can tour the award-winning restaurants in the region, ticking Michelin-starred establishments off the bucket list and devouring traditional nosh in rustic mountain huts. There’s mountains of skiing opportunity for each and every level, with the Dolomiti Superski pass unlocking over a thousand kilometres of terrain for experts and wide groomers for beginners and intermediates in the local Alta Badia area. Non-skiers won’t be disappointed either, with historic buildings and museums, excellent spas and cafes and some seriously scenic winter walking routes. For a group night out, head to Hug’s Disco for cocktails and dancing until 2am. The main accommodation type in San Cassiano is hotels, which works wonderfully for groups who have friends that may want to join up later. Group members can choose the room type that suits them, and communal bars and restaurants bring everyone together.